We're very close to the release of Sekiro: Shadows Die Twice, with the Japanese action adventure title sneaking up on us in just a few days. Luckily, it's looking like another seriously impressive effort from, er, From Software, a studio that currently has a great track record. In the above video, PlayStation Underground explores a few different areas and, spoiler alert, faces an enemy type we've not seen before. If you want to get in the mood for the brutal Sengoku era inspired adventure, this will get the job done -- although we imagine many of you just want to play the game for yourself at this point. 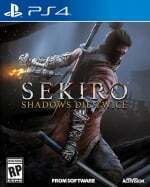 Are you planning on getting Sekiro at launch on PS4? Do you think it'll be up to From's high standard? Execute a shinobi death blow in the comments below. Had dispatch email from game collection this morning. So any luck will be here tomorrow or Thursday. @suikoden Yep yep! Gamestop took the money from my account today, so I'm hoping it arrives Thursday. Gotta love when they ship it too soon and you get to play it a day early. @Boxmonkey if you can wait for sales, more power to you! Or at least more money! Activision be like- Sekiro: customers pay twice.. I'm ready. I'm so ready. I can't wait. @Shepherd_Tallon awesome and enjoy...I love my local GameStop. Good people at that one. Had it installed since Saturday, the countdown timer is killing me! Just got through blight town in dark souls remastered. I will not play another game until i beat dark souls. Wow its a good game, cant believe i never played it before. @pimpjuice i know u dont like activision, but what does that even mean? @ellsworth004 Defeated valkyrie queen on god of war, I'm already good lol. The problem is my game time is limited and replaying the same place over and over again doesn't excite me. @Shigurui Yeah the countdown is a killer! Can't wait for this now, but I've deliberately avoided all of the trailers recently. Want to go into the game knowing as little as possible. @Aslanmagic Yeah we've been fairly lucky with the staff at our nearest Gamestops, too. It makes all the difference. The game is looking great . After seeing this I think I'll buy this game, the game at least has fast travel system that will cut the tedium of traversing the same area over and over again.